A priority for the Trump administration is to wage a concerted attack against immigrants and refugees. We’ve already seen what this looks like: Muslim and Refugee bans, ramped-up internal immigration enforcement, racial profiling, harassment, and privacy violations at the US border. This is only the beginning. Trump is gearing up to unleash a wave of raids that will be unprecedented in both number and intensity. It is no exaggeration to say that ICE agents are now terrorizing our communities, our neighbors, and our families. Immigrants fearful of being detained and separated from their families are being pushed deeper into the shadows. This is not who we are, and this is not what the majority of Americans voted for. Trump won’t stop terrorizing immigrants on his own—it is up to all of us to stop him. Fighting back on these attacks remains a top priority for Indivisible. We strongly believe that all of Trump’s anti-immigrant policies can be stopped by Congress. Indivisible will continue to pressure MoCs to do their job, to protect families from being torn apart, and to protect democracy from this aspiring tyrant. But protecting our communities will require an even greater commitment. To this end, we will support local efforts intended to shield immigrants and other vulnerable communities from the terror brought upon them by this administration. While Indivisible’s mission is to empower groups to realize their constituent power through congressional advocacy, we also want to recognize how important this issue is for all of us. 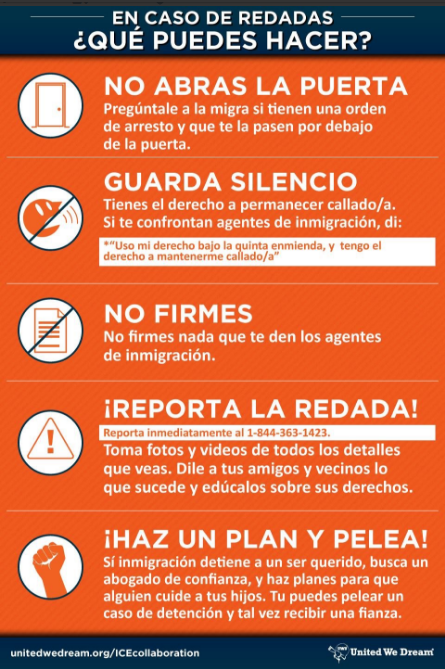 Below are some suggested local activities to help protect immigrants and to fight back these anti-immigrant attacks. 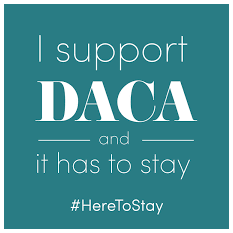 Connect and support local immigrant rights organizations. Local immigration groups will be on the front lines protecting families against Trump’s deportation force—and they need your help! We recommend connecting with these groups in your area. Invite them to your meetings, share their resources, sign up for their alerts. You may need to do a little bit of research to find out what groups operate near you, but here is one directory to get you started. Help spread “Know Your Rights” materials in your community. You and your neighbors may have lots of questions about what legal rights and protections immigrants have. 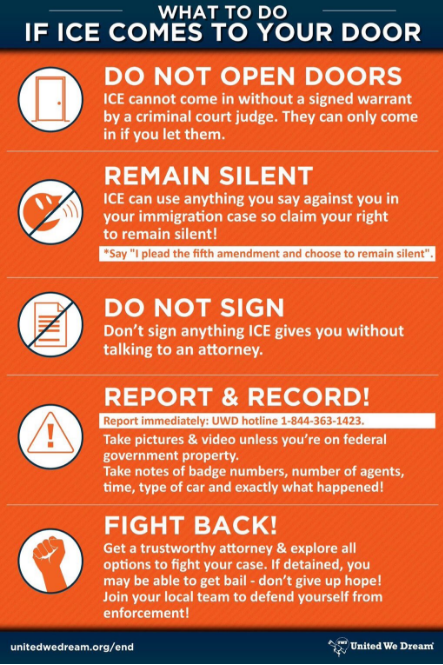 Being informed can be the key difference between a parent being able to come home to their kids or finding themselves in ICE custody. We encourage you to read up on what those rights are and help disseminate them with your friends and family. You can find resources here and here. Make sure local officials aren’t facilitating immigration raids. In some cases, local officials, including police departments, are assisting ICE officers in their immigration raids. This should not be their job. Turning police officers into immigration officers does more harm than good and undermines the community’s trust of police officers. Talk to your local officials and let them know that you don’t want them acting as immigration officers. For talking points see here. Push your local government and other institutions to adopt “sanctuary” policies. Cities, local and state governments, colleges and universities, hospitals and clinics, and places of worship are adopting policies to help protect immigrants from immigration enforcement. A sanctuary policy is not a refusal to follow the law – it is a commitment to refuse to unnecessarily cooperate with immigration officers. For more information about sanctuary policies, see here. Civil rights groups are criticizing border agents’ “sledgehammer approach” to vetting international travelers at airports around the country, a troubling trend as President Donald Trump prepares to sign his new ban on immigrants and refugees. Agents are reportedly detaining and threatening to deport travelers, questioning them about their religions, and demanding access to their phones and social media platforms, often targeting those with non-Western names or in certain professions—including Muhammad Ali’s American-born son and a French Holocaust historian. “It’s basically a sledgehammer approach,” he said. 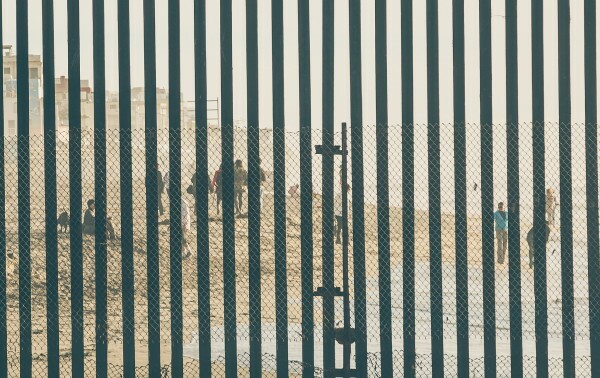 The issue is particularly worrying as the White House is expected to unveil a new executive order on immigration that the administration has promised will be “tailored” to survive a court battle, unlike Trump’s previous memorandum, which was suspended just days after its implementation in January. The new order was expected to come as early as Wednesday, but White House officials reportedly scrapped the signage amid positive reviews of Trump’s first address to a joint session of Congress. Still, that speech included the announcement of a new federal office to support “American victims” of crimes committed by undocumented immigrants, giving little reassurance that the president’s stance on immigration had softened.